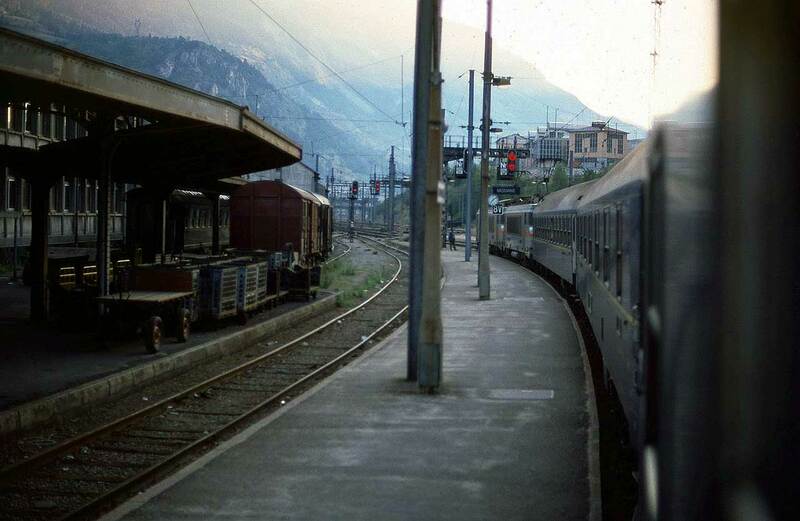 The Citalian Express was a once a week charter train and ship service between the UK and Italy. 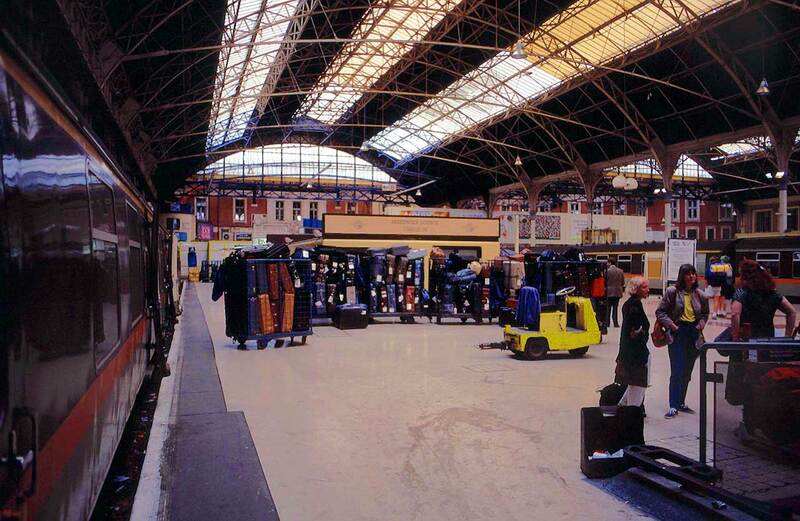 Operations ceased in the Autumn of 1992. Before the introduction of the internet and on line booking, travel companies issued annual glossy colour brochures advertising the various destinations and options available. For Italy, one of the main companies was Citalia. Although other companies offered similar packages by air to Italy, Citalia, no doubt because of Italian State ownership at this time (it is now owned by TUI Travel), they offered a civilised alternative to flying with all its associated bureaucracy, unsociable flight times, excessive check in times and then the veal crate type seating found on aeroplanes. What was their alternative? 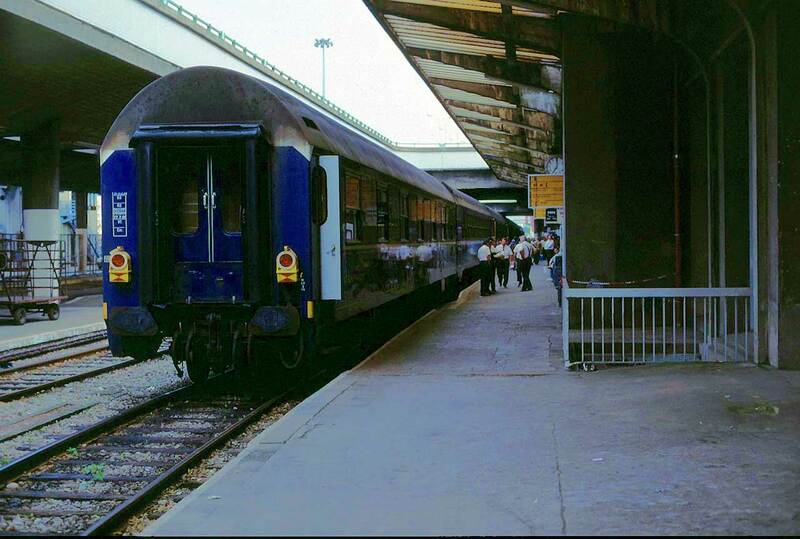 The answer was Citalia's exclusive charter train, the Citalian Express. The Citalian Express was not just one single train of course due to the presence of some water between England and France but consisted firstly of a charter train from London Victoria consisting of two Southern Region 4CEP electric multiple units which ran non stop to Folkestone Harbour, only stopping and reversing of course at Folkestone East, then a Sealink ship to Boulogne and then another charter train which ran through to Rome. 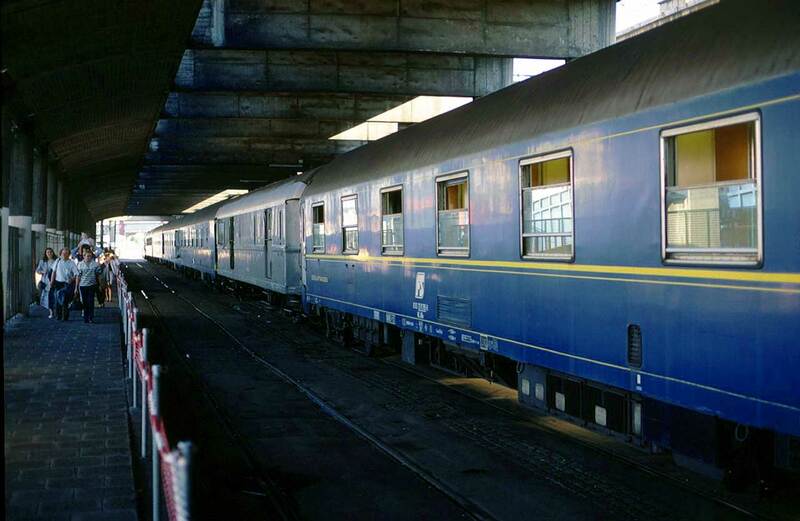 The Continental train consisted of ten FS (Ferrovia dello Stato, Italian State railways), CIWL Type MU sleeping cars. There was no restaurant car but in the centre of the train there was a bogie van containing electric ovens where the meals on route were warmed and served in your compartment. Departure was every summer Saturday from London Victoria Platform 8 at 13:45, arriving Folkestone Harbour at 15:15. Depart by ship at 16:20 remembering to advance your clock one hour and arrive Boulogne at 18:30. Departure form Boulogne Maritime was at 19:23. In the return direction the train departed Rome on Friday morning. 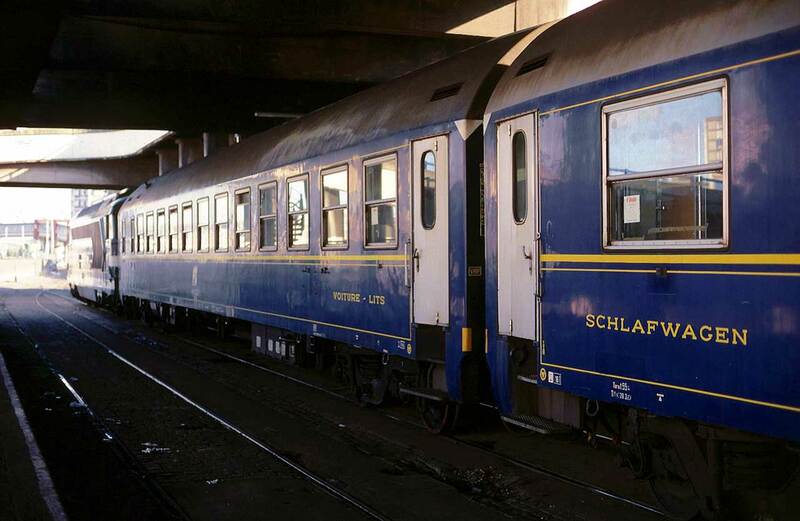 The last Citalian Express operated during the 1992 season and was discontinued thereafter. How much more convenient for customers would it be today if the Continental train or for that matter the present day Venice Simplon Orient Express departed from London St. Pancras direct to Italy? Once the Channel Tunnel and the Continental loading gauge line had been opened, there is no logical reason for this not happening. No doubt because of the present day petty politics of rail privatisation and the associated fragmentation, this will ensure that it will never be allowed to happen. Anyway, up until 1992 Citalia produced an information booklet containing general holiday information and including a route description. This information, from the 1989 edition is repeated here. 1. Leaving the Continental side of Victoria Station, the boat train climbs steeply (1 in 62) towards the Thames. 2. We cross the river on the Grosvenor Bridge and can see Chelsea Bridge on the right. 3. Sydenham Hill Tunnel runs below the vast grounds of the old Crystal Palace which was burned down in 1936. It is now the sight of the National Sports Centre. 4. Bickley Curves - this complicated track layout which dates back to the 1920's when the lines of the South Eastern and the London, Chatham & Dover Railways were linked. 5. Polhill Tunnel runs below the high ground on which the magnificent Knockholt Beeches stand. 6. Sevenoaks Tunnel penetrates the main ridge of the North Downs. 7. Tonbridge is the very busy junction station for lines to Redhill (for the Gatwick Airport line), Hastings and the Kent Coast ports. A famous public school is also located here. 8. The line for the next 26 miles is dead straight between Tonbridge and Ashford is the longest straight stretch in the UK. 35 miles (57km). 9. Passing through the beautiful Kent countryside it is easy to see why this county is known as the "Garden of England". As we pass through numerous hop fields we have frequent views of the curiously shaped oasthouses. Near Staplehurst in June 1865, the Continental Express on which Charles Dickens was travelling was derailed due to repair men failing to replace a section of bridge. The crash affected Dickens' nervous system and hastened his demise. 10. Ashford, a major junction, was engineering headquarters of the old South Eastern Railway. On Saturdays a large market is held here which can be seen from the left hand side of the train. 11. After passing through Folkestone Central we pass into some sidings at Folkestone East, reverse direction and go down the branch line to Folkestone Harbour. This section of line is the steepest section of passenger track in the UK. 12. 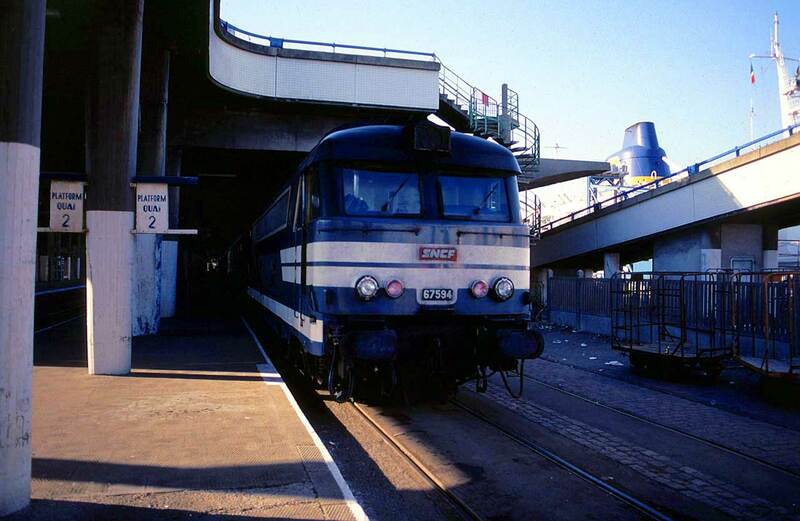 Boulogne Maritime has been completely modernised and provides a very quick and efficient service, ideal for disembarking from the ferry and joining the train. 13. Boulogne is a major ferry and fishing port, noted especially for its fine cathedral. 14. At and around Etaples (called "eat apples" by soldiers in the First World War) are numerous was cemeteries splendidly maintained by the War Graves Commission. The large resort seen to the north west of the train is Le Touquet. 15. The river flowing peacefully through the meadows to the east of the train is the Somme. Here some of the worst battles of the First World War were fought during 1916. 16. 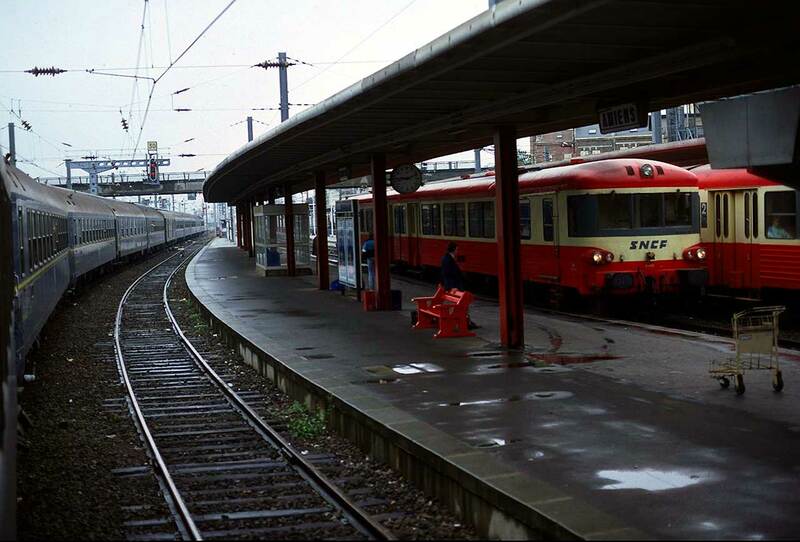 The train stops at Amien for several minutes whilst the diesel locomotive is replaced by an electric locomotive. Magnificent steam locomotives worked the Amien - coastal ports until 1971. 17. After travelling at high speed down the main line and passing the large town of Creil, the outer suburbs of Paris come into view. 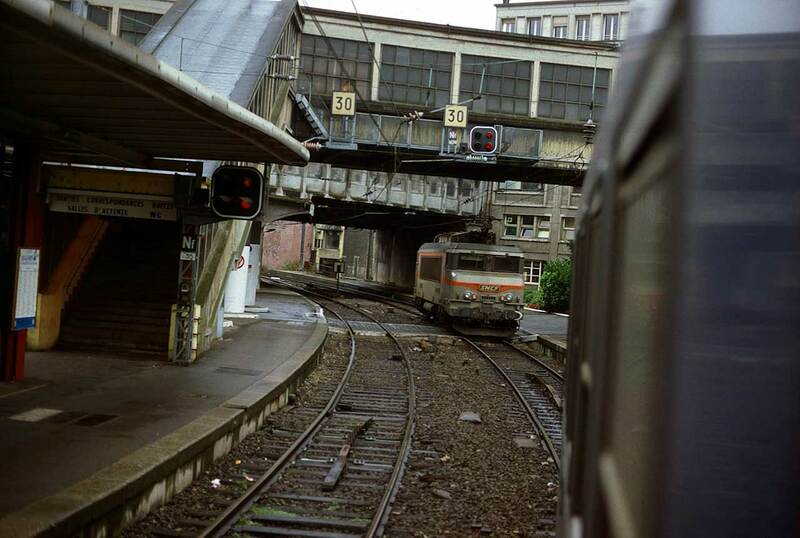 The train switches to the outer belt line (Grande Ceinture) just after passing Pierrefitte Station. A stop is made at Bobigny for fresh supplies of water. 18. As the train continues around the Grande Ceinture it passes close to the historic Le Bourget Airport where air services to Croydon began in 1919. To the west the lights of Paris are brilliant with the Sacre Coeur de Montmarte dome floodlit. The outline of the Eiffel Tower may be seen. The line crosses the River Marne three times on its way around the eastern side of the French capital. 19. A short stop is made at Valenton for a crew change. A few minutes after leaving, the train rounds a curve and joins the main line to the south east. 20. At 30 miles (45 km) from Paris, the lights of the outer suburbs of Melum flash past. 21. Just beyond Laroche the new track of the TGV (ultra high speed trains) goes of to Lyon and the south. 22. Blaisy Bas Tunnel marks the summit of the Burgundy Hills with their thousands of vineyards. The tunnel is just over 2 miles (3km) long. 23. Macon, centre of an important wine growing region producing Maconais. It is on the Saone River, with such wines as Pouilly-Fuisse on the west bank and Beaujolais to the east and south. 24. Aux Les Bains, a fashionable lakeside spa in the Alpine foothills. 25. A technical stop at of around 15 minutes is made at Chambery to take on fresh supplies of water and change crews. 26. 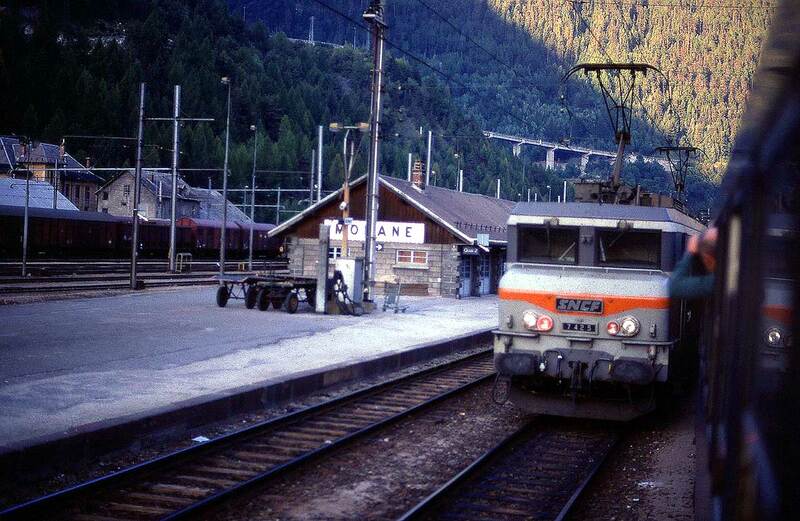 Daylight will have come when the train pulls in to Modane, the French frontier station at the northern portal of the long Mont Cenis Tunnel under the Alps. The tunnel is 8 miles (13km) long and takes about 14 minutes to transit. Be sure to ask for an early call if you wish to take in some of the breathtaking scenery before or after the tunnel. 27. As the train arrives in Italy at the south portal of the Mont Cenis Tunnel it is over 3000ft (1000m) above sea level. There may be a short technical stop at the first Italian Station on the route, Bardonecchia. 28. Just south of here, among the Alps, is Sestriere, Europe's first purpose built ski resort, particularly noted for its tall circular hotels and Sauze D'Oulx, for many years popular with British skiers. 29. Leaving the beautiful hilly countryside, the train comes to the outskirts of the huge industrial town of Turin (Torino), where the factories of the car giant Fiat can be found. a short technical stop is made at Porta Nuova Station. 30. Asti - famous of course for its sparkling wine, Asti Spumanti. The city is also noted for its splendid cathedral. 31. The train, travelling over viaducts and through tunnels, passes through some of the more attractive scenery before reaching the junction of Alessandria. 32. 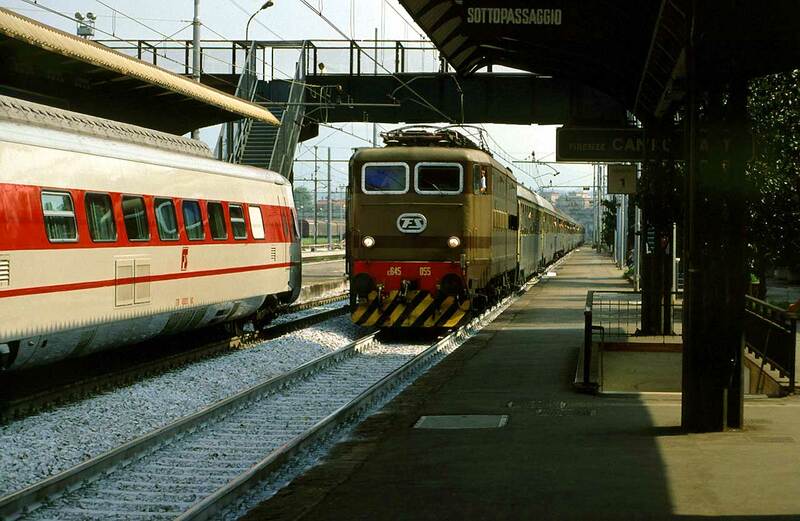 The train is due into Piacenza late morning, where passengers for Lake Garda leave the train and join their coaches. The city, which is on the famous Po River, has a population of 100,000. It is a major agricultural centre and is situated in the centre of industrial Italy. 33. Parma is one of Northern Italy's cities of art and was the birthplace of Toscanini. The population is 170,000 and there are numerous classical buildings, especially churches. It is the main city of the region of Romagna and is situated on a tributary of the Po. Parma is probably best known as being the original producer of Parma Ham and Parmesan Cheese. It is also known for having a great operatic tradition in the past. Many of Verdi's operas opened here. 34. Modena is a city of 150,000 people and is probably best know for its production of Prosciutto ham. 35. One of the most important cities of art in Italy, with a population of half a million, Bologna is the ancient capital of Romagna. It has two cathedrals, one from the 10th century and the other a 14th century edifice. 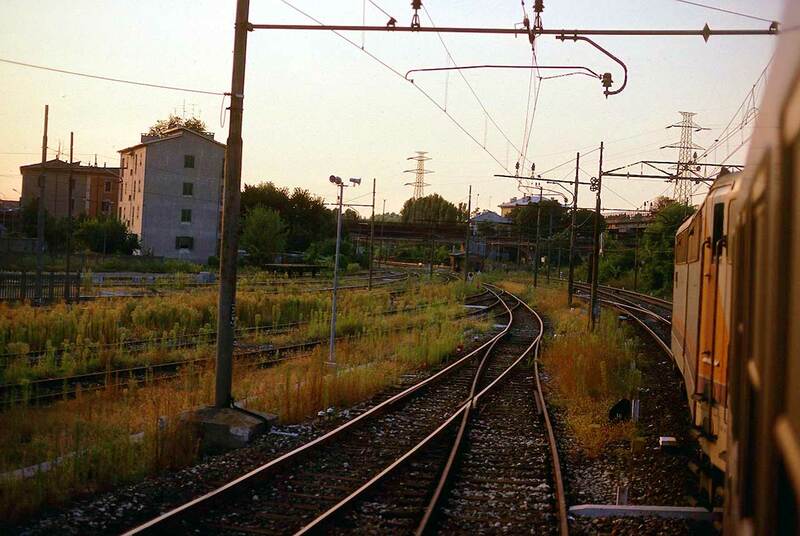 The train stops here for passengers staying in Venice, The Lido and the Adriatic Riviera. 36. Florence Campo Marte is the next stopping point. Here passengers for Florence and the Versilian coast leave the train. 37. We reach the end of our journey at Rome Ostiense Station. This is not like the large bustling Termini Station but smallish and perfect for passengers to be picked up by their coaches. Total distance from London, 761 miles (1272km). Click on photos for a larger image. Use browser "BACK" button to return. 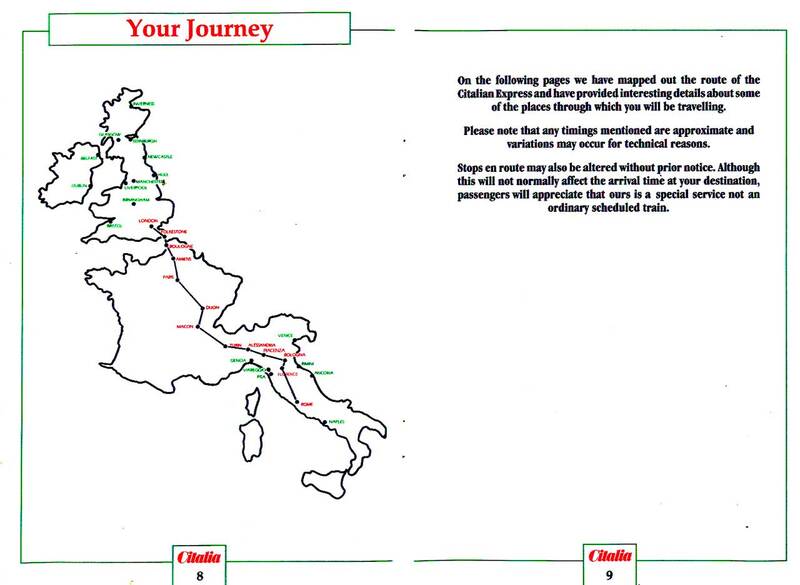 Points of interest along the route of the Citalian Express are highlighted in the information booklet. Departure point at Platform 8 at London Victoria. Luggage, previously labelled with the allocated CIWL sleeping car number was collected by Citalia representatives and loaded in the guard's van of the train. Luggage was checked through and was deposited at the door of your Continental sleeping car. Having crossed the English Channel, we are now in France at Boulogne. 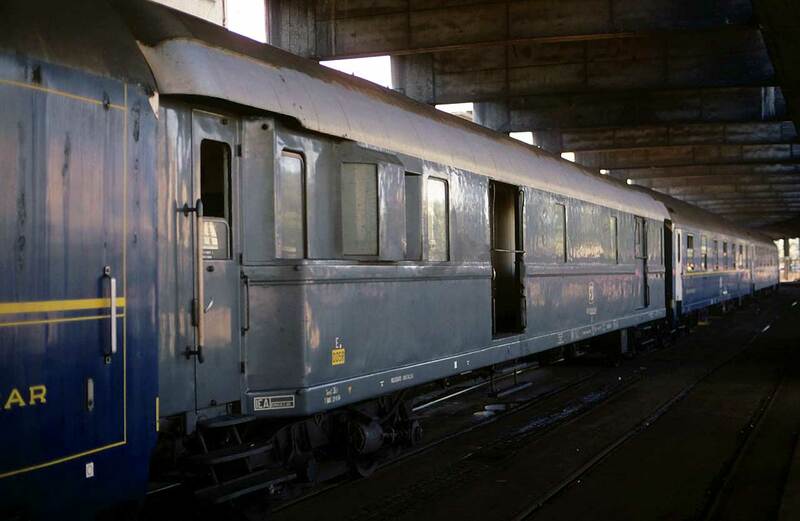 All passenger accommodation was in CIWL Type MU sleeping cars. After disembarkation from the ship, there was a short walk around the train to the departure platform. Not having to carry your luggage was a great convenience. 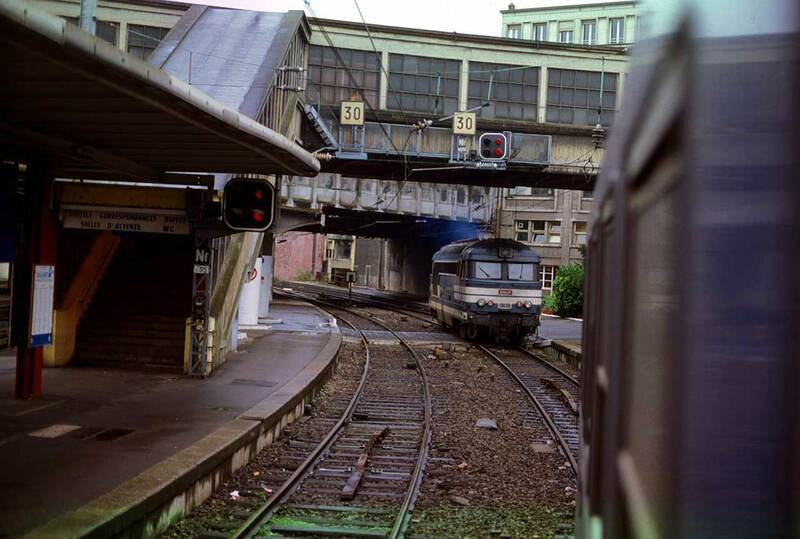 Having reached the departure platform, all you had to do was find your sleeping car where your luggage would be waiting. Because of the full size opening windows it was much more convenient to transfer the luggage via the open window. Ready to depart. The SNCF Class 67 diesel electric locomotive will take the Citalian Express from Boulogne Maritime to Amiens where traction is changed to electric. Early on Sunday morning and we stop at the final station in France at Modane. Here the two SNCF electric locomotives are removed and replaced with an Italian E656 locomotive. After an excellent two weeks in Italy we are at Florence Campo Marte as an E645 brings in the return Citalian Express for Boulogne. One of the many advantages of travelling by train is what may be observed on route. 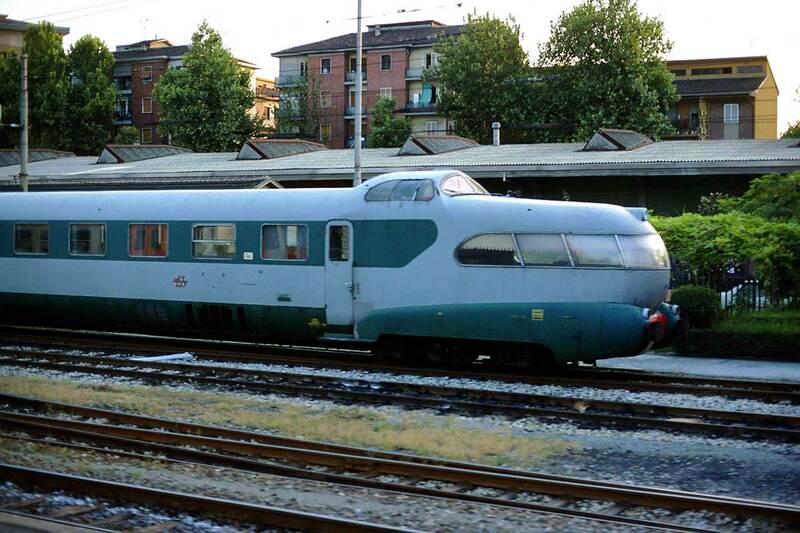 We are just departing Asti and we see an ETR250 Arlecchino (Harlequin) electric train, well just half of it actually. What a magnificent way it would be to travel comfortably seated in the front observation lounge. Our final evening in Italy and as the sun sets a Class E646 leads the Citalian Express northwest from Asti. The following morning and we are in France at Amiens. The electric locomotive has been detached as this is as far as the electrification extends. Looking back down the Citalian Express the complete train of ten sleeping cars and the bogie van may be seen. Although still in France, the weather has become very British. It is 09:10 on a dreech Saturday morning. For the final part of the journey in France a Class 67 diesel electric locomotive takes us from Amiens to Boulogne Maritime.